The Wolverines were one of only two remaining undefeated Division I teams. The second-to-last undefeated college basketball team has gone down. The Michigan Wolverines, ranked second in the AP poll and fourth in the coaches’ poll with a 17-0 record heading into Saturday’s road contest at Wisconsin, fell 64-54 to the Badgers. That leaves the No. 4 Virginia Cavaliers (15-0, and they play at No. 1 Duke Saturday night) as the only undefeated NCAA Division I men’s basketball team. The Wolverines started Saturday’s game off well, and led 27-25 at the half. They went up 31-27 just over two minutes into the second half, and stayed ahead until the 12:55 mark, but things went downhill from there. A three-pointer from Aleem Ford gave the Badgers their first lead of the half, and while Michigan was able to restore a 43-40 lead shortly afterwards, Wisconsin then started to take over. Ford made a layup while being fouled and hit the foul shot to tie the game, and while the Wolverines’ Charles Matthews then put them back in front with a free throw, Wisconsin’s Kobe King got the rebound on the second free throw. 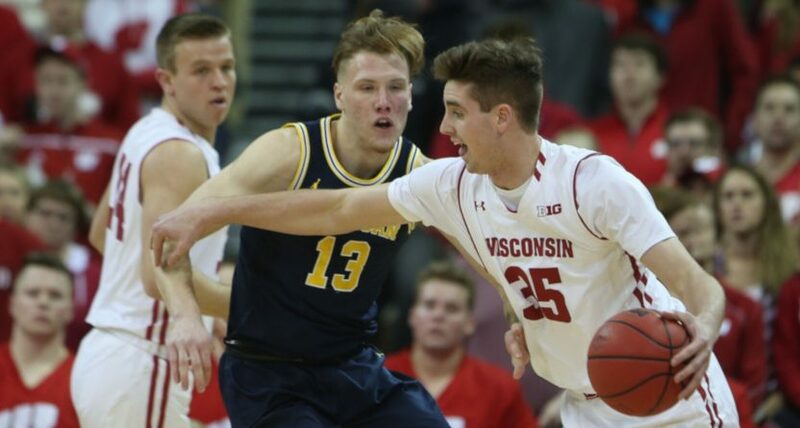 D’Mitrik Trice then missed a layup and Michigan’s Jon Teske rebounded it, but the Badgers’ Brad Davison came up with a crucial steal; that set up an Ethan Happ layup to put Wisconsin up 45-44 with 7:43 left, and they’d never trail again. Happ led the way for the Badgers with 26 points, 10 rebounds and seven assists, while Reuvers had nine points, three rebounds and two blocks and Ford chipped in nine points and two rebounds off the bench. Wisconsin also held Michigan to 40.8 percent shooting from the field, well below their season average of 47.1 percent, and forced 16 turnovers (well above their season average of 9.5). The win improves the Badgers’ record to 12-6, while the Wolverines fall to 17-1. Michigan next hosts Minnesota Tuesday, while Wisconsin plays at Illinois Wednesday.